While most students returned home during Thanksgiving break, the Thacher Football team stayed at school preparing for their CIF Finals game versus Mojave. In their most successful season since bringing football to the school, the Toads saw themselves become the number two team in the state and the number one seed in the CIF Division 1 playoffs. To get to the finals game, which was played on November 29th at Thacher, the Toads, lead by senior captains Lukas Cesena and Emmanuel Aruho defeated Amino Leadership 62-18, Laguna Blanca 60-20, and Chadwick 48-26. Thacher had one last goal ahead of them to finish out the season: the CIF Division 1 Championship. Luckily, the Toads earned home field advantage by winning the coin toss. People from Ojai, families of players and Thacher students past and present flooded the field to watch the game. Coach Jeff Hooper commented that playing in front of a large crowd was enjoyable. Going into the season the team knew they lost many key parts of their offense and defense from the previous year, but the seniors were able to lead the team into the playoffs. Marshall Fisher ‘15 spoke about the ups and the downs of the team’s season. The coaching staff also had extra help from ex-quarterback, Zane Schryver CdeP 2013. Coaches mentioned that Schryver assisted them in getting specific points across to the team, an ability that he had mastered in his time at Thacher. 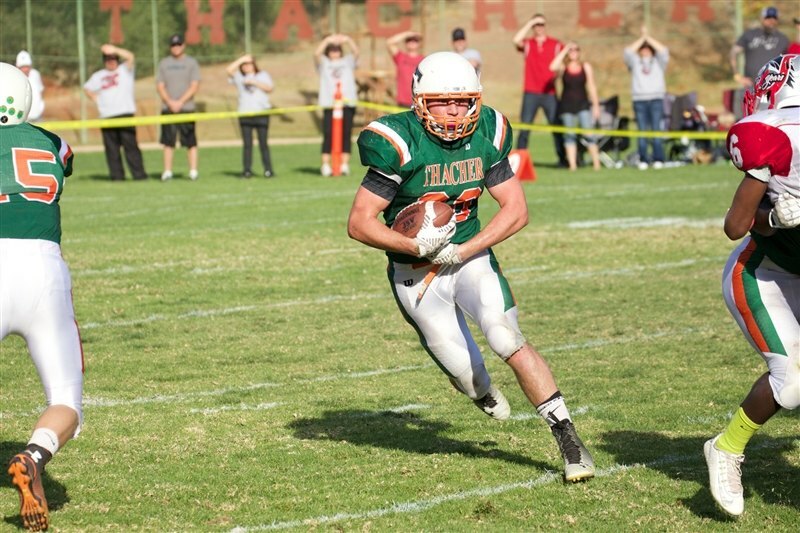 Thacher started the game strong, scoring the first two touchdowns. However, Mojave was able to create a pair of turnovers at pivotal moments and was able to score the next 21 points. On the ensuing drive, Cesena was able to run through the line for the score with 9:16 left in the fourth quarter. The next play became the pivotal moment of the game. Trailing by one, the team attempted a two point conversion. The ball once again was handed to Cesena. He fought through tacklers and appeared to cross the goal line, with fans erupting into cheers. The referee, however, ruled that his knee had hit the ground before the ball crossed the goal line. Mojave’s defense was able to withhold the Toads next offensive possession and prevented Thacher from scoring when they blocked a last-second field goal attempt by Chase Van Kalsbeek ’16. Coach Cash Achziger of Mojave was complimentary on the Thacher football team and the game in general. The Senior leadership on the team was as strong as ever and the end of the game was emotional for all, especially for all the senior leaders. Quarterback John Carey ’15 spoke passionately about his experience in his final game and final season at Thacher. With an emotional end of the season Coach Hooper looked fondly on his team’s success.